Khaalia Hillsman debates her options against Sydney Stipanovich, left, and Michelle Nwokedi. Photo by Benita West/TGTVSports1. 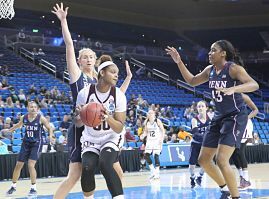 Los Angeles – For the first three quarters of Saturday’s NCAA Tournament opener, 12th-seeded Penn dominated fifth-seed Texas A&M. 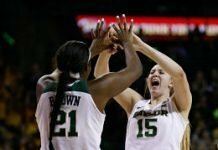 They out shot them, 50 to 27 percent, played with urgency and carried the momentum over an Aggie squad that sometimes looked lethargic. 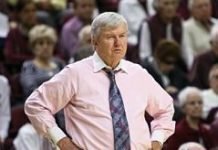 But in the fourth quarter, the Aggies woke up and turned the 52-35 deficit they went in with into a 63-61 win – the largest comeback in NCAA Tournament history. Khaalia Hillsman paced Texas A&M with a career-high 27 points and nine rebounds, while Danni Williams added 15 points, which included a clutch three-point shot with 36.2 seconds to go that gave the Aggies the momentum to close out the game. They began their 25-1 run with 8:57 to play, keeping the Quakers from scoring a field goal. The Williams shot cut Penn’s lead to 59-58, and an ensuing Hillsman bucket gave Texas A&M their first lead since the 19.1 seconds in the first quarter. Jasmine Lumpkin then stole the ball, which resulted in two Williams free throws. 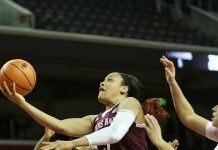 Anriel Howard had 16 rebounds for the Aggies, and Curtyce Knox’s eight assists made her the first player in both school and Southeastern Conference history to score more than 300 assists in a single season, with 303. 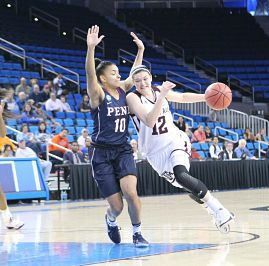 Sydney Stipanovich led the Quakers with 20 points, and Michelle Nwokedi added 15. Texas A&M coach Gary Blair said the game hinged on momentum. Danni Williams drives on Anna Ross. Photo by Benita West/TGTVSports1. Blair said stops and starts have been the hallmark of what he termed a “reloading” season. Hillsman, who scored 15 of her points in the final quarter, said that even she was struggling in the game. That “something” was saving the game for Knox and fellow senior Taylor Cooper. “I was trying to leave it all on the floor because I didn’t want ‘Tyce to go home. I wasn’t going to go home either,” Hillsman said. Curtyce Knox begins the fast break for Texas A&M. Photo by Benita West/TGTVSports1. Stipanovich credited the Aggies defensive intensity in the last period. Penn coach Mike McLaughlin said it was one of the hardest losses he’d ever experienced. “It is just a real difficult time right now,” McLaughlin said. Texas A&M will face UCLA in the Tournament second round Monday at 7 p.m.